Big plants are ideal, but plants that get out of control and grow too big can be problematic. Here are a few tips to point you in the right direction when it comes to taming plant size. When growing cannabis indoors, managing the size of a crop is an important factor of the operation. Plants that grow too big are harder to manage, less discreet, and may experience reductions in health and even yield if they are not tamed and controlled. But wait a second, aren’t bigger plants better? Doesn’t that equate to more buds and therefore a bigger stash when harvest time comes around? No, this isn’t necessarily true. Sure, big plants are good news, but those that grow beyond the capacity of the growing environment or against the grower’s goals are not advantageous. For example, some growers may aim for and prioritise privacy and discretion, and therefore will want to employ methods to keep their plants small, compact, and generally low-key. Other growers may be dealing with very limited space and will need to prevent their plants from growing past a certain size. If, for example, plants grow too tall in a small space, they may exist far too close to their light source and risk getting burnt or bleached. Another reason why it’s important not to let indoor plants grow beyond maintainable heights is the fact that they may become delicate and outweigh the capacity of their own structural support. Outdoor plants can usually handle tall heights as they are used to being battered and swayed by the wind, and their stems adjust to such a challenge. Indoor plants don’t have this external stress to adapt to, so towering heights might be a risk factor towards collapse. If you are an indoor grower that is concerned about the possibility of your plants exceeding a certain height and growing out of control, then check out the following tips and employ them within your grow operation to manage your plants optimally. There are numerous environmental factors that can be controlled in order to minimise height, however, it is best to start with genetics. Some strains are destined to grow smaller than others due to their genetic makeup. Sativa strains are well-known for their towering heights, long leaves, and spindly stems. Indica strains, on the other hand, are usually much smaller, denser, and more compact. Furthermore, autoflowering indica strains contain ruderalis genetics, and usually feature even smaller statures. You will need to find the sweet spot for your lighting setup. It’s important not to keep your lights too close to your plants, as this can increase the risk of burning the leaves, an occurrence that can affect the overall health of your plants. However, with that said, keeping your lights too far away can cause your plants to seek the light, surging in upward growth as a step towards survival. The latter is problematic to growers who are seeking to maintain a small plant size. In this case, it may be preferable to keep the lighters closer, and regularly check for any potential burning taking place. If you notice that your plants are already making some serious upward movements within the vegetative phase, then it’s time to take some action. 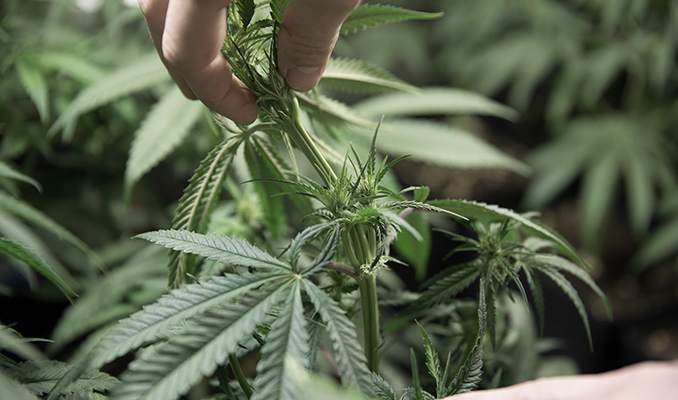 During this stage of the grow cycle, despite how counterproductive it may seem, you can cut down a portion of your plant to prevent further overgrowth within the flowering stage. Making sure that enough leaves remain in order for the plant to survive, prune your plant down to around half of the size that you wish it to reach at the end of the grow. After the pruning is complete, and considering your plants are not autoflowering varieties, shift the light cycle into 12-12, meaning 12 hours on and 12 hours off. This balance of light and darkness will force your plants into the flowering stage of the grow cycle. This is ideal, as your plant will likely stretch even further during this stage, so switching to flowering as soon as possible will reduce overall potential size. Low stress training your plants or bending them is a great way to tame their overall height, and also helps all parts of the plant receive equal amounts of light. The branches and top of a plant can be pulled down using strings and cages, making the plant flat. This procedure is quite delicate, and better performed during the vegetative stage when stems are more flexible. Temperature can affect the vertical growth of some plants. By controlling temperature and using a timer to ensure that the day temperature is less than the night temperature, growers can keep their plants shorter. Some plants respond to this pattern by remaining shorter and more compact. Fans can be used to simulate the wind that is present in natural outdoor conditions. Plants react to this external stress trigger by increasing stem thickness and sturdiness in order to cope, and upward growth may be reduced. Freezing Cannabis - Should You?